Today I had a dream where an unseen person told me the price of oil had moved up by $7.20. I assume that means per barrel, but they did not say. This is a market I have not been watching, but I am starting now. For most of 2011 to 2014, prices stayed in the $80 to $110 range before dropping in July 2014 and finally hitting bottom, below $30, in February 2016. Since then they bounced back up. The current price is $49.27. Prices have traded in the $45 to $55 range during the past six months, as shown in the chart below. So an increase of $7.20 would be a big move, putting it near the top of the range, depending on the starting point. I was not shown the starting or ending prices or any dates, but there is an OPEC meeting scheduled for next Thursday, May 25. OPEC is expected to extend their agreement to curb production for at least another six months and possibly nine months. Extending the agreement should be bullish for prices, but is likely already priced in since it is public knowledge. Based on my previous dreams and visions, the initial price movement has often moved in the opposite direction from what I have seen, so it is not an invitation to jump in right away. For now, I am just watching and waiting to see if we get a counter move down before going long. For increased leveraged in trading oil, I found Proshares offers 3X Crude Oil Ultrapro Bull ETF (OILU) and Bear ETF (OILD). Regarding silver prices, I am out of the market currently, waiting to see a recognizable pattern, which I have shared in previous posts. Without knowing the dates or the starting prices, this information is incomplete, not enough for making trading decisions. It is offered only as a starting point for prayerful consideration and is not a recommendation for investing. Oil has been moving hand-in hand with silver for the past few years. This is because cost of production sets precious metal prices, not supply/demand. Check out http://srsroccoreport.com for an in-depth explanation. Also, output doesn’t control oil prices. I believe that’s a false narrative from the media to cover up low economic growth. Low demand from low growth causes oil prices to fall. The global debt is peaking and we have no growth to show for it. No growth means shrinking credit. Shrinking credit means deflation. If oil prices rise, it will only be temporary. Oil’s fundamentals show that is has to drop long-term because of Energy Return On Investment (EROI), also explained at the above mentioned website. Maybe your dream indicates the move before oil will decouple from precious metals because fundamentals will be in play once again. We’ll see…..
James with the increased production in Canada & the U.S. , even if OPEC continues the cuts there should be downward pressure on the price per barrel . This would indicate it would likely be a geo-political event that would cause the increase , thow a 7.20 increase is not enough for a war event likely , unless it is moving up that much daily . I agree. So after it moves up, it seems likely to come right back down. I had a dream about oil. It was for a $7 drop. It came to pass in 10 days. I don’t trade oil and like you I had no dates. The DXY is looking like a down trend. If i’m looking correctly at the chart it could be going to 95 area soon. I missed yesterdays action. It was only a 2% drop ,but there were many areas to make great gains. This was just an example of what we can look forward to in the future. The Gold/silver ratio GSR is going up but silver is not responding. Can’t figure that out either. The miners today gave back most of yesterdays gains. Thanks for sharing that Ed. It must be my turn now. The next few weeks should be interesting. 49.20 is the top, right now! Exactly a 7.20 move up. Amazing work. Lined up with technicals perfectly. Let’s see if it holds and drops. Does this ” Oil Prices Moving Up $7.20 ” start to happen yet? I am still waiting to long the oil ( OILU ) ? You are referring to the dream I had on May 18 where somebody told me the price of oil had moved up by $7.20. I assumed that meant per barrel, but they did not say. At the time, oil prices were at about $49.25 and moving up. 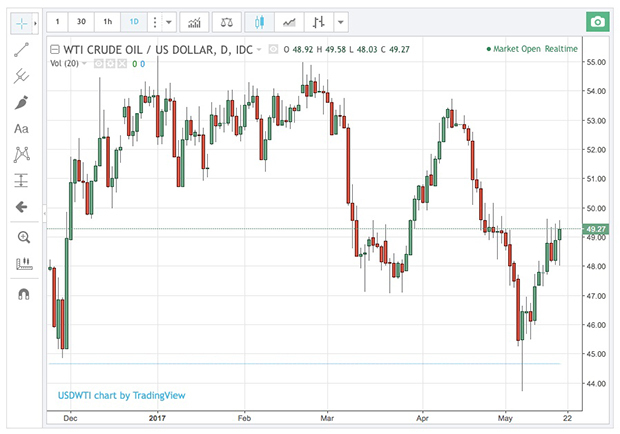 It moved up to about $52.00 on May 25, then turned down and dropped for the next four weeks until hitting a bottom at $42.00 on June 21. Then the price moved up about $5.00, slightly above $47.00. From there it dropped down to where it closed Friday at $44.36. So what I saw has not yet been fulfilled. I am waiting for the price to drop back down to $42.00 because I believe the $7.20 climb will start there. James, I think we peaked maybe. Possibly, but I am still watching for a $7.20 move up because that’s the way I heard it. If it drops down to $42 I am planning to open a long position with OILU. James this is off topic, but I wanted to make sure you have seen this. http://www.thecommonsenseshow.com/2017/05/18/will-there-be-a-civil-war-if-trump-is-impeached/ This is sounding more and more like the dream I have had and the wake up call of the gun shot and the word, Lincoln. James, are you still holding a short position or are you on the side lines? I closed my short position after the steep drop this week. I believe equities will move back up close to 2400 before starting the big 100+ point drop. If it retests the lows around 2355, I am going to open a new long position, probably FAS. However, I am also watching for a drop in oil. If crude oil drops down around $45 or $46 per barrel, which is near the bottom of the recent range, I am planning to buy some OILU. So for now, I am on the sidelines waiting and watching. Thanks, I will watch for that, but would find it confusing if that is what it means because I heard dollars.